Two buses carrying high school band students to an amusement park Thursday slammed into a freeway wreck that happened right in front of them, crushing a pickup truck and killing its 19-year-old driver and one of the students. Dozens of other students were treated for injuries. The wreck near Gray Summit, about 40 miles west of St. Louis, happened when the pickup truck rear-ended a semi cab that had slowed down because it was nearing a construction zone, state police said. The first bus, which was carrying female band members from John F. Hodge High in St. James, slammed into the back of the pickup, then was launched on top of it after it was rear-ended by the second bus, State Highway Patrol Cpl. Jeff Wilson said. At least 42 students were taken to hospitals, most with injuries not considered life-threatening. The students were on their way to a Six Flags amusement park some 10 miles from the crash site. "My goodness. You send your children off to Six Flags, you don't expect this to happen," Missouri State Highway Patrol Sgt. Dan Crain said. "Being parents, we cannot imagine how difficult this is." Joy Tucker, the superintendent of the St. James school system, said the 3,700-resident town - known for its wineries, natural splendor and trout fishing in nearby Maramec Spring Park - was devastated. The clearly shaken superintendent was called in to identify the dead student, reports CBS News' Cynthia Bowers in Chicago. "It's been a horrible, horrible day in our community, and we'll never get over this," Tucker said. "Anytime you have something like this, it is big tragedy for a community," echoed Dennis Wilson, the mayor of St. James. He described the community as "one of those towns where you know just about everyone in town and know their kids," including the nearly 600 children who attend Hodge high school. Ashley Wiehle, a spokeswoman for SSM Cardinal Glennon Children's Medical Center in St. Louis, said 36 children were taken to that hospital, and that each appeared to be in good condition. They were to be examined as a precaution, Wiehle said. Bethany Pope, a spokeswoman for St. Johns's Mercy Medical Center in suburban St. Louis, said six victims were sent there. One of them was later transferred to St. Louis Children's Hospital; the other five were being discharged Thursday afternoon. Jackie Ferman, a spokeswoman for the Children's Hospital, said an injured 16-year-old St. James girl was in stable condition and was still being assessed by hospital staff. Four other victims were taken with minor injuries to St. Clare Health Center in Fenton, Mo., a spokeswoman said. Incredibly, most of the students were reunited with their parents by mid-afternoon. Highway Patrol Cpl. Jeff Wilson said the driver of the first bus moved into the passing lane to give a distressed vehicle in the shoulder more room. She was checking her rearview mirror while returning to the right-hand lane when she noticed the first impact but could not stop in time, hitting the pickup. 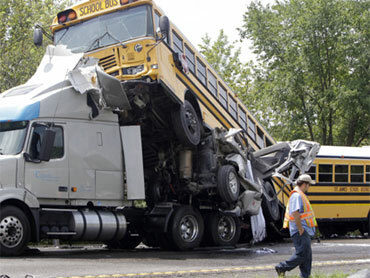 The second bus then rear-ended the first, vaulting the first bus onto the top of the pickup, which was crushed. The buses were segregated by gender, with girls in the first and boys on the other, Wilson said. Missouri Highway Patrol said the girl who was killed was sitting in the back right of the bus, reports CBS affiliate KMOV. They believe the front left of the second bus slamming into the first bus caused her death. The pickup was barely recognizable in the tangled wreckage. Hours later, crews using a crane gently lifted the buses off of the crushed wreckage to try to clear the freeway, which was closed going eastbound. Traffic backed up in that direction for as much as 10 miles. A spokeswoman for the National Transportation Safety Board said a team of 14 investigators will look into the accident and try to determine if there's a broader safety issue. No charges have been filed. Officials say their investigation could take two weeks.